For someone’s big one year birthday! How am I here? What is my life? What was this year? Today is Max’s first birthday and I am 100% absolutely convinced that the universe is chugging out days more quickly than ever before. So here’s the thing about a blog. It gives you the ability to look back on every single day and see what you were rambling about. I don’t ever do this because, hello – it’s horrifying. It’s either right in line with or worse than listening to the sound of your own voice on a recording of some sort. I loathe going back and revisiting my work of any kind. I don’t think I’ve read one single thing aside from recipe instructions in my cookbook since turning in the edits to my manuscript. Read my old blog posts? Oh wait, let me go sit on a bed of nails first because that would be more enjoyable. Do you get me? I know you get me. BUT. Now I’m a mom and there are all these major life firsts, it’s like living life over again in a weird way. Which is so awesome because seeing all these things for the first time, through Max’s eyes, is wild and crazy and hilarious and adorable. The amount of times my heart wants to explode in a day tops at least twenty, and it’s not because of pizza or bacon. So. I can go back and read over these last twelve months, especially since I don’t remember one single thing and have mombrain 24/7 now. And yes, I’ve heard all of these reports in the last year saying that mombrain is not a thing, but guess what? THEY’RE WRONG. I don’t care who they are. But they are wrong. I have tried insanely hard to keep this place as authentically me over the last 365 days, without running it straight into baby town. It hasn’t been too difficult; in fact, it’s quite similar to how I’ve felt in my every day life. So passionate and obsessed with my baby, so in love with this little chunk, but still so passionate and obsessed with my work too. I didn’t just stop loving what I do or stop caring about it once Max was born. I like a little separation between the two. And I’m constantly trying to figure out how to do both, 500+% as I want to, without missing a beat. Obviously, not wanting to miss a moment of Max, as those are much more special and can’t be repeated. And trying to fit everything into my head which feels like it’s overflowing all the time. The short of it is, it’s been the best and most wonderful and also most exhausting and craziest year ever. If you’re into the baby stuff, there is so much more on the baby page itself, and I’ll be sharing over there about his birthday and our yearly favorites and what not. And his party! Which is tomorrow, by the way, and in true psychotic first-time mom fashion, I’ve probably gone way overboard. And that brings me to his smash cake. Eddie and I have been talking about Max’s first birthday for, well… a year. Like since he was born, probably. And we tossed the idea of a theme back and forth, settling on a jungle theme for a few weeks (Max loves giraffes but, um, are giraffes in the jungle?) and then scratching it, never finding something we thought… fit. So we decided on lots of bright colors – red, blue, green, yellow and orange – tons of balloons, party hats and clearly – sprinkles! 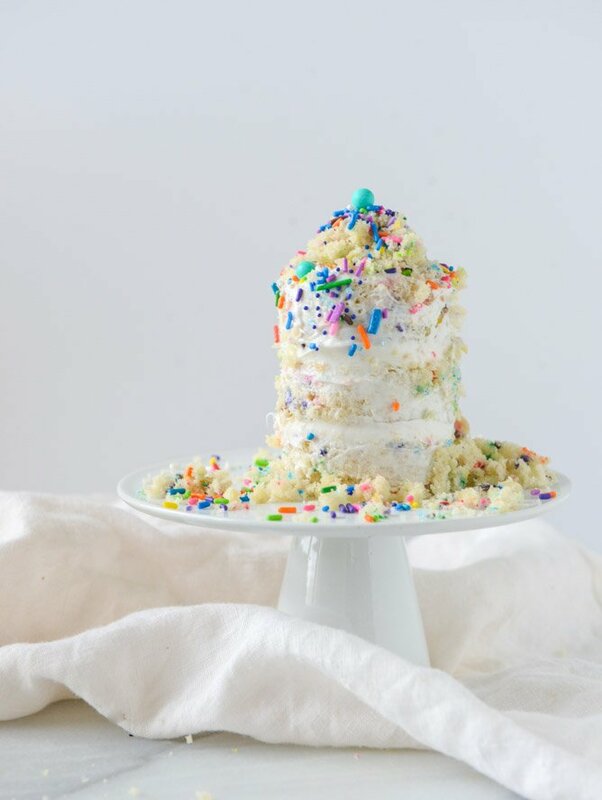 This recipe is disguised as a smash cake but it’s actually… the confetti cake recipe from my cookbook, aka, the updated version of my funfetti cupcakes and quite possibly one of the most requested recipes here. The recipe makes twelve cupcakes, which fits perfectly into two small cake pans for a layered smash cake. And that was my plan all along, but then once I saw it, I decided to make even SMALLER mini cakes and do a triple layer version, like this. Today, Eddie and I are going to sing to Max and have our own little special birthday party on the day he was born, just the three of us. He’ll be all sugared up, just in time for his party tomorrow, where I have the slightly bigger smash cake, the recipe in the two can pans, not cut into tiny circles. Ridiculously excited doesn’t even begin to describe it. 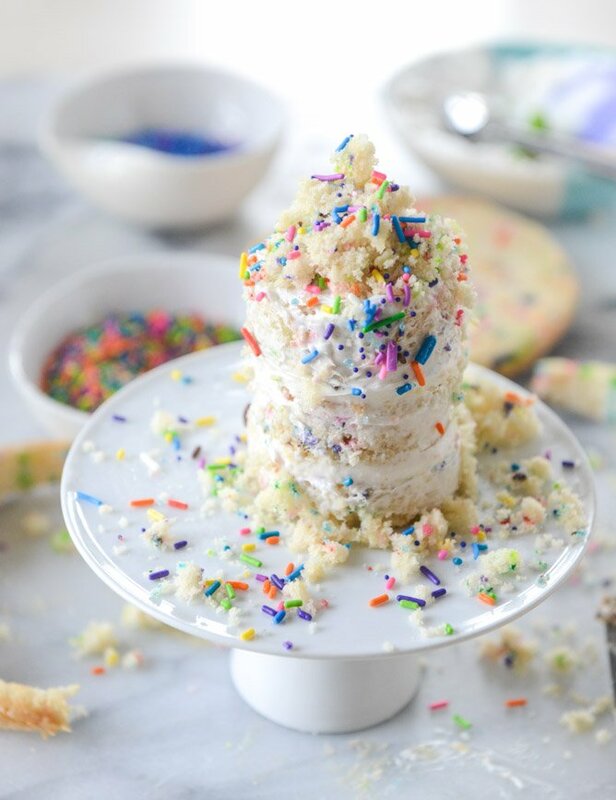 Totally calls for sprinkles, right?! Preheat the oven to 350 degrees F. Butter and flour two mini cake pans – mine were 4 1/2 x 2 inches. Add the butter to the bowl of an electric mixer and beat it until creamy. Add the sugar and beat with the butter on high speed until fluffy, 2 to 3 minutes. Add in the egg and egg white, mixing well on medium speed until combined. Scrape down the sides of the bowl if needed. Add in the oil and vanilla extract, beating on medium speed for another minute. With the mixer on low speed, add in half of the dry ingredients. Pour in the milk. Add in the other half of the dry ingredients and mix them on medium speed until the batter is combined. Use a large spatula to gently stir in the sprinkles. Divide the batter evenly between the two cake pans. Bake until the tops are set, about 18 to 20 minutes. Let cool completely, then gently turn the cakes out on a piece of parchment paper, using a knife to release the edges if needed. Let cool completely before frosting. To make this little cake like I did, use a 2-inch biscuit cutter to cut rounds (you can definitely get 2 rounds, MAYBE 3 if you line it up just right) out of each cake. 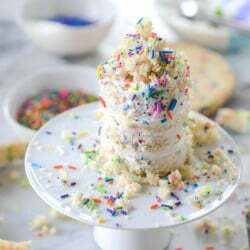 Use the leftover cake crumbs for sprinkling! Add the butter and cream cheese to the bowl of an electric mixer and beat on high speed until creamy and combined. With the mixer on low speed, slowly add in the sugar. Beat until the sugar is incorporated and add vanilla extract. Scrape down the sides of the bowl if needed. Beat the frosting on high speed for 2 to 3 minutes until fluffy and creamy. If the frosting seems too thick, beat in the tablespoon of milk for 1 to 2 minutes until combined. Frost the cakes and top them with additional sprinkles. oh and P.S. I’ll be drowning in puddle of tears since now I have a toddler. What? This not only looks totally delicious, it’s also the cutest darn cake I’ve ever seen! And happy birthday to your boy! I’m sure it will be a blast. I still can’t believe it’s been ONE YEAR. Just no. Time needs to stop. Happy birthday, Max! That year went by fast. I found out I was pregnant right around the time you had him, and I loved reading your pregnancy posts. My baby is three months now– it’s crazy how time flies! This is such a cute smash cake!! Sprinkles are the best. Happy birthday to Max!! Happy birthday to your sweet Max!! The cake is adorable!! Love this cake, so adorable!! Happy birthday to Max, he is the cutest!!! Happy Birthday Max! I have loved following along for his first year. Can’t wait to see how his party turns out! Enjoy! Happy Birthday Max!!! My boy turned 1 Nov 20, and I did a theme-less party – primary colors – balloons, hats, sprinkle cupcakes and smash cake (white cake and frosting). Yours looks way better than mine :) It turned out Hudson was afraid of the hats and decided he doesn’t like anything sticky (frosting) anymore. He did love all of his gifts. I love reading your posts because it is exactly how I feel. Your ability to verbalize your emotions is a true talent. Happy birthday to your little boy! I’m sure he will love this smash cake, and the adorable party you have planned for him. What a great idea it’s just the right size cake for a toddler and so cute too. I hope Max has a great birthday! I imagine the best part of this cake is that when no one is looking, you get to eat all the cake bits which did not make it into the cake shape (when cutting out the tiers). More so, it doesn’t count against your diet because when the cake gets cut to make the circles, all the calories fly out of the smaller, leftover bits. Happy birthday to your little guy! The smash cake is so cute. He’s going to love it! Also: are those sprinkles from Sweetapolita?? The cake, is perfect Jessica! Happy birthday MOM and little Max! So much to celebrate! This is the sweetest little cake..! Oh Happy, Happy Birthday, Max! What a wonderful year for you, Jessica…I remember going grocery shopping with my little baby girl staring back at me from the seat in the cart with her big brown eyes. I could barely get my shopping done…heart exploding and tears all over the place. If you can believe it, time just keeps going faster and faster and boom….suddenly they’re in the next stage, then the next stage and you just wonder how it’s happening so terribly fast…. Enjoy every minute of it! Congratulations on making the first year. Cute as a button cake to match your son! Oh my gosh this is so cute!! 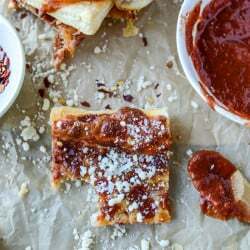 I love this idea I wouldn’t smash it I would eat it all to myself!!! Cute Cake! Will you share where you get your sprinkles? I am looking for the color blend you used.